Hey, I have a question. The mod states it's supposed to add 10,000 carry weight and make companions more stealthy, but so far my companions with me only have an added carry weight of 1,000 (That or Valkyrie is naturally a lifting machine), and enemies detect my companion's footsteps from a mile away always. They are all wearing the ring, but they are only seemingly affected by it's base stats, not by it's sneak or weight additions. Always excellent mods! Thanks, Thuggysmurf! Finally actually playing the game after nearly 2 years of modding instead. This is a little OP for my desires but I figure I can crack it open in xEdit and tweak to my hearts content, I just had no idea what things needed tweaking before. With this you've got all the pertinent info in one handy esp, so I'll even learn something. Many thanks! Sure thing. 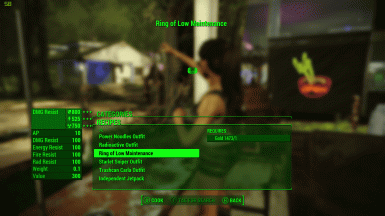 The ring is meant for companions, it's gonna be OP for player unless you aren't wearing any other armor except a base vault suit or something. It's pretty easy to adjust in xEdit though, just tweak the values under the "Hard to Kill" enchantment to whatever fancies you. 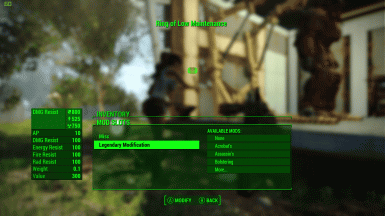 Double-check the Utility menu or reinstall and make sure the mod is activated. Not sure what else to tell you. It works for everyone else. I am wondering if there is a way to edit the resistance values and turning of/off effects without digging way to far into the files. Open in FO4Edit. Under Object Effect, choose "enchHardToKill", then adjust the magnitude values to whatever you want. Can the bowler hat be equipped on the deathclaw companion from Fusion City Rising? I didn't intend for the hat to work on deathclaw companions, but if it does, would be good to know. The bowler hat was meant for Codsworth. Excellent mod! I love how it combines options from multiple mods I was using. Endorsed Endorsed Endorsed!Thank you!!! Jesus Himself wore this ring before he took it off and died. How much does the RoLM increase companion carry weight by? I'm really tired of both of us being encumbered and then having to drop ALL the s*** and force them to pick it up, so I want to know how helpful this is. This is one of my favorite mods. Have one small request. 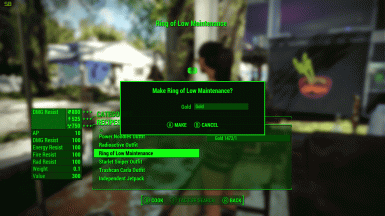 Can you make a "power ring", like the power rings for special, they can be equipped, like an ekstra piece of PA equipment, so we can wear our helmets along with this awesome mod I dont know, how the guy made those powerarmor rings, but something, that makes the "ring" equipable, while still wearing all power armor. (including helm.) Something, you would be willing to do?